The Kelowna Rockets will face the Spokane Chiefs for the second time in less than a week tomorrow night at Prospera Place. Kelowna was last in action on Saturday, they defeated the Kamloops Blazers 2-1 in overtime. Assistant captain, Kaedan Korczak says that the Rockets are ready to take on the Chiefs again. Following tomorrow nights game Kelowna and Spokane will play each other another two times this season. The next time they’ll face off will be February 22nd at Spokane Veterans Memorial Arena. They’ll wrap up the regular season series March 13th at Prospera Place. The Rockets have a record of 21-25-4-1 which gives them 47 points and places them in third place in the B.C. Division. They’re ten points ahead of the fifth-place Prince George Cougars and two points in front of the fourth-place Kamloops Blazers. Kelowna trails the Victoria Royals by six points for second place while the Vancouver Giants are in the top spot with 69 points. The Spokane Chiefs sit in third place in the U.S. Division with 58 points and a 26-17-2-4 record. They’re 14 points up on the fifth-place Seattle Thunderbirds and are three points ahead of the fourth place Tri-City Americans. The Chiefs trail the second place Portland Winterhawks by 11 points while the Everett Silvertips sit atop the division standings with 76 points. 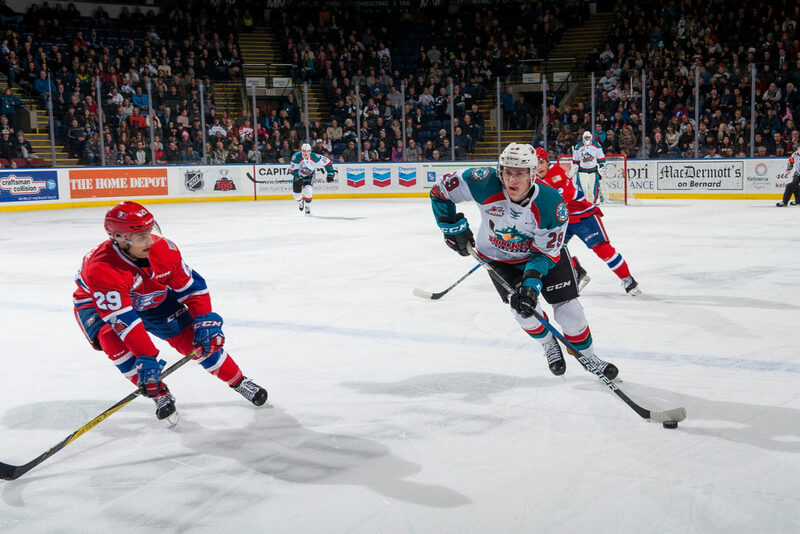 Come watch the Rockets battle Los Angeles Kings prospect Jaret Anderson-Dolan and the Spokane Chiefs on Hat Trick Wednesday. Purchase your ticket before 2:00 pm on game day and watch the game with a hot dog and pop for $19.99. Tickets are on sale at selectyourtickets.com, at the Prospera Place box office or by phone at 250-762-5050.